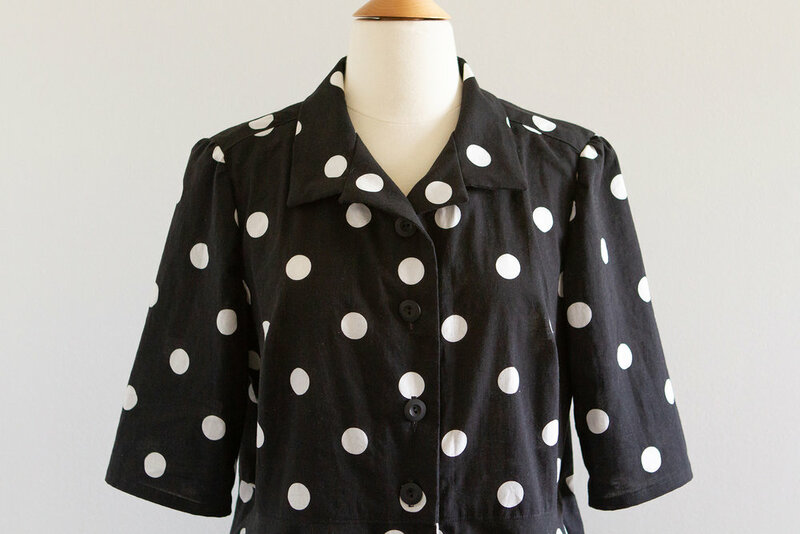 Are you a team black and white (neutral) or a team colourful when it comes to clothing? I'm someone who always likes to dressed in colours. I have many colourful cheery dresses in my closet but almost no little black dresses. There's nothing wrong with black clothes, it's just not my thing. Colours make me happy, I feel good in them. But lately, I've been drawn to black and white more. 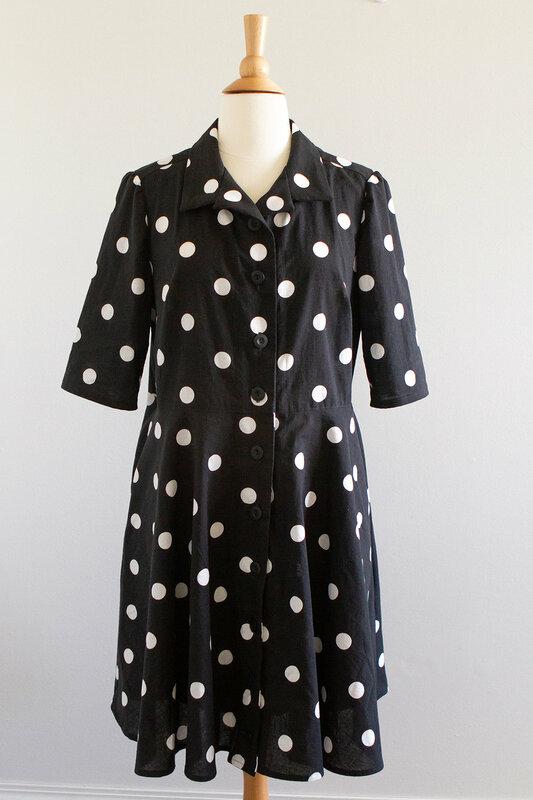 Monotone can be fun too, especially when it's with polka-dots, plaids, and other cute prints! I used view D but I took out the fullness of the skirt a bit. It was a full circle skirt and while it's cute, I find it not so practical. Tiny breeze can lift up the skirt easily, but changing it to even 270 degree circle can help! I also lengthened the sleeves. 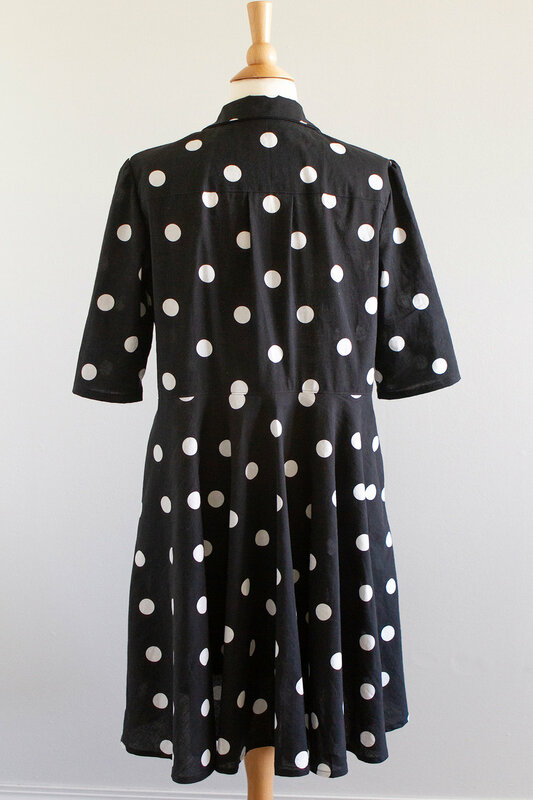 I only did the pattern matching dots to the front bodice because I didn't have enough fabric to do them all. Plus, when I have to do the pattern matching, it feels like I'm wasting a lot of fabric... Also I don't have enough patience to match the print perfectly everywhere. The collar, the back bodice and the skirt pattern alignment could have been better, but other than that, not much is too noticeable so it's all good. 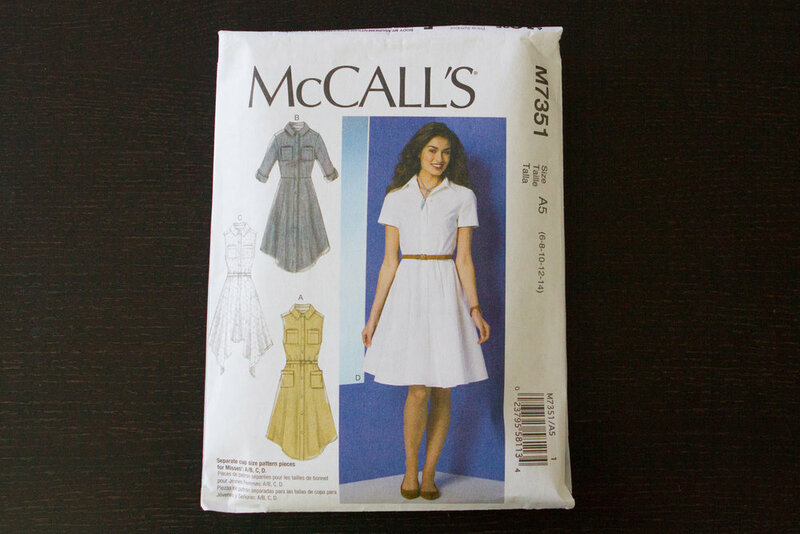 McCall's M7351 originally has a regular shirt collar with a band. I don't have a graceful long neck (ok, you might be laughing right now but that's reality! I have a short neck), so I usually prefer flat collar or open collar. This time I tried re-drafting it to have an open collar! I'm not a fan of big pointy collar (though I love big round collar, so picky I know). That's why I kept the collar and the opening pretty small and subtle. 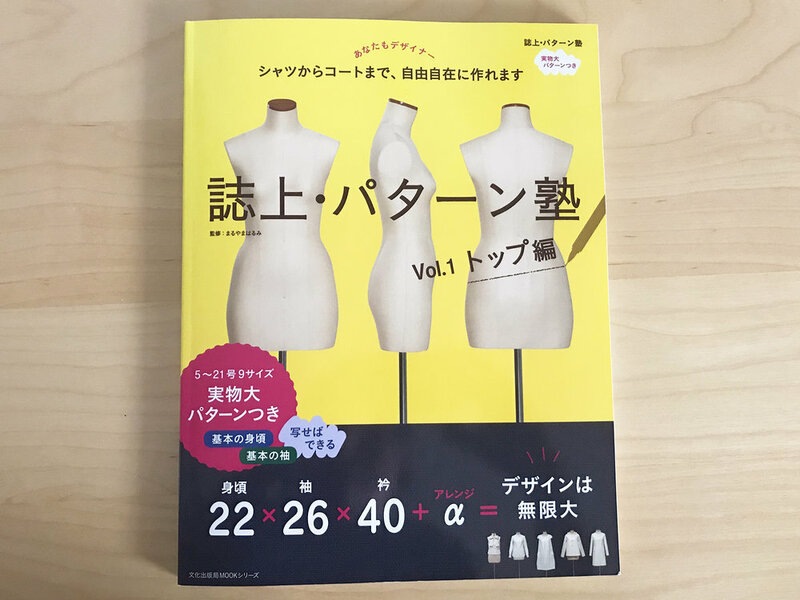 Again, this book was really helpful when I was drafting an open collar. I really like the back style of M7351! Love love love the yoke and the pleats. M7351 has a fitted bodice, but since the bodice only has bust darts and no waist/back darts, it's easy to make it semi-fitted. I generally like loosely fitted clothes, they're more comfortable and less hot (breezy). I left some ease around the waist for that reason, and the result might not be as slimming or elegant but comfort is more important for me! If I wanted to look more dressy or slimming, I could always add a belt. 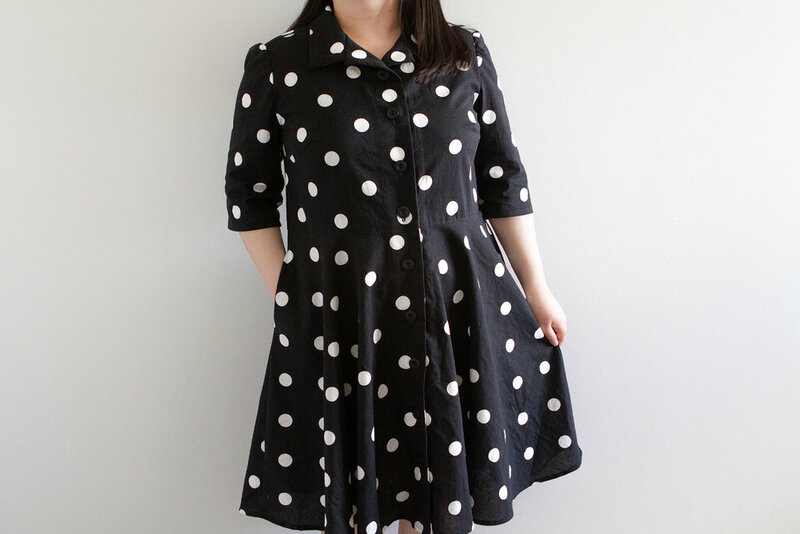 A couple of years ago, I was making and wearing a lot of fit and flare dresses with cardigans like they were my uniform. I still love that style but I find it hard to dress down with fit and flare. Since I'm more into casual style nowadays, shirt dress now has become my favourite style of dresses. They're easy to dress up or down. They can look like a grown up's clothes, but they can also be fun! 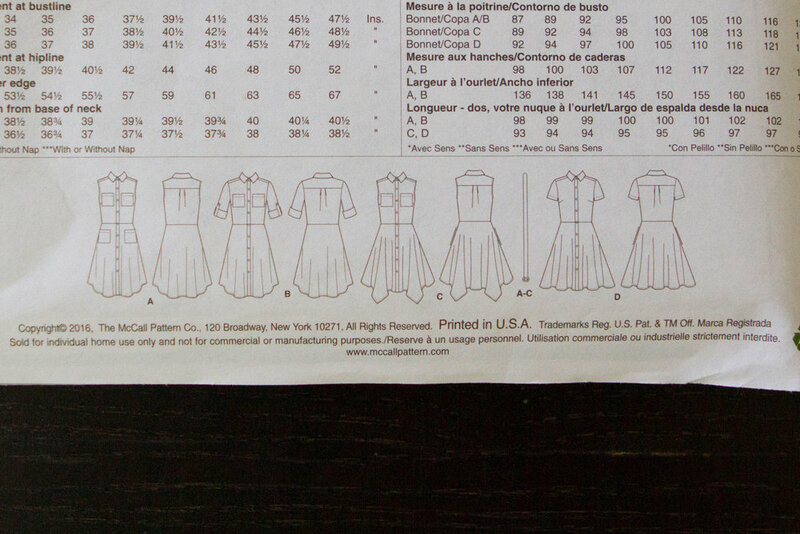 The down side of shirt dress making is that it has so many buttons ( I don't like hand sewing). But that's not enough to keep me from making them!